Bernhardt was born in Paris as Rosine Bernardt, the daughter of Julie Bernardt (1821, Amsterdam – 1876, Paris) and an unknown father. Julie was one of six children of an itinerant Jewish spectacle merchant, “vision specialist” and petty criminal, Moritz Baruch Bernardt, and Sara Hirsch (later known as Janetta Hartog; c. 1797–1829). Five weeks after his first wife’s death in 1829, Julie’s father remarried Sara Kinsbergen (1809–1878). He had abandoned his five daughters and one son with their stepmother by 1835. Julie together with her younger sister Rosine, left for Paris, where she made a living as a courtesan and was known by the name “Youle.” Julie had five daughters, including a twin who died in infancy in 1843. Sarah Bernhardt changed her first name and added an “h” to her surname. Her birth records were lost in a fire in 1871. In order to prove French citizenship, necessary for Légion d’honneur eligibility, she created false birth records, in which she was the daughter of “Judith van Hard” and “Édouard Bernardt” from Le Havre, in later stories either a law student, accountant, naval cadet or naval officer. When Sarah was young her mother sent her to Grandchamp, an Augustine convent school near Versailles. In 1860 she began attending the Conservatoire de Musique at Déclamation in Paris and eventually became a student at the Comédie Française where she would have her acting debut (August 11, 1862) in the title role of Racine‘s Iphigénie to lackluster reviews. Her time there was short lived; she was asked to resign after slapping another actress across the face for shoving her younger sister during a birthday celebration for Molière. Much of the uncertainty about Bernhardt’s life arises because of her tendency to exaggerate and distort. Alexandre Dumas, fils, described her as a notorious liar. Bernhardt’s stage career started in 1862 while she was a student at the Comédie-Française, France’s most prestigious theater. She decided to leave France, and soon ended up in Belgium, where she became the mistress of Henri, Prince de Ligne, and gave birth to their son, Maurice, in 1864. After Maurice’s birth, the Prince proposed marriage, but his family forbade it and persuaded Bernhardt to refuse and end their relationship. When expelled from the Comédie Française (see above) she resumed the life of courtesan to which her mother had introduced her at a young age, and made considerable money during that period (1862–65). During this time she acquired her famous coffin, in which she often slept in lieu of a bed – claiming that doing so helped her understand her many tragic roles. Sarah then reverted to the theater, securing a contract at the Théâtre de L’Odéon where she began performing in 1866. Her most famous performance there was her travesty performance as the Florentine minstrel in François Coppé’s Le Passant (January 1869). With the outbreak of the Franco-Prussian war performances were stopped and Sarah converted the theatre into a makeshift hospital where she took care of the soldiers wounded on the battlefield. She made her fame on the stages of Europe in the 1870s and was soon in demand all over Europe and in New York. In between tours Sarah took over the lease of the Théâtre de la Renaissance, which she ran as producer-director-star from 1893 to 1899. In 1872, she left the Odéon and returned to Comédie-Française. One of her remarkable successes there was in the title role of Voltaire’s Zaïre (1874). She even traveled to Cuba and performed in the Sauto Theater, in Matanzas, in 1887. She coached many young women in the art of acting, including actress and courtesan Liane de Pougy. In 1899 Bernhardt took over the former Théâtre des Nations on the Place du Châtelet, renaming it the Théâtre Sarah-Bernhardt and opening on 21 January in one of her most admired parts, the title role in Victorien Sardou‘s La Tosca. This was followed by revivals of Racine’s Phèdre (24 February), Octave Feuillet’s Dalila (8 March), Gaston de Wailly’s Patron Bénic (14 March), Edmond Rostand‘s La Samaritaine (25 March), and Alexandre Dumas fils‘s La Dame aux Camélias on 9 April. On 20 May, Sarah premiered her most controversial part, the title role in Shakespeare’s Hamlet, in a prose adaptation which she had commissioned from Eugène Morand and Marcel Schwob. The play was greeted with rave reviews despite its running time of four hours. She developed a reputation as a serious dramatic actress, earning the title “The Divine Sarah”; arguably, she was the most famous actress of the 19th century. Bernhardt also participated in scandalous productions such as John Wesley De Kay‘s “Judas.” It performed in New York’s Globe Theatre for only one night in December 1910 before it was banned there, as well as in Boston and Philadelphia. In New York’s art scene of 1910 the story line of the play was nothing short of scandalous. Mary Magdalene, who at first became a lover of Pontius Pilate, then of Judas Iscariot, got involved with Jesus. Judas, after realizing that Mary Magdalene had given herself to Jesus, decided to betray his friend to the Romans. To top the provocation of New York’s theater lovers, Judas was played by the voluptuous Sarah Bernhardt. In Paris, Bernhardt continued to direct the Théâtre Sarah-Bernhardt until her death, when her son Maurice took over. After his death in 1928, the theatre retained the name Sarah Bernhardt until the Occupation by the Germans in World War II, when the name was changed to Théâtre de la Cité because of Bernhardt’s Jewish ancestry. After establishing herself on the stage, by age 25 Sarah began to study painting and sculpture. She studied under Mathieu Meusnier and Emilio Franceschi. Her early work consisted mainly of bust portraiture, but later works were more ambitious in design. Fifty works have been documented, of which 25 are known to still exist, including the naturalistic marble Après la Tempête (National Museum of Women in the Arts.) Her work was exhibited at the Salon 1874 – 1886, with several items shown in the Columbia Exposition in Chicago and at the 1900 Exposition Universelle. Bernhardt also painted, and while on a theatrical tour to New York, hosted a private viewing of her paintings and sculpture for 500 guests. She may be best known for her 1880 Art Nouveau decorative bronze inkwell, which portrays a self-portrait with bat wings and a fish tail (Museum of Fine Arts, Boston). This may have been inspired by her 1874 performance in Le Sphinx. Bernhardt had an affair with a Belgian nobleman, Charles-Joseph Eugène Henri Georges Lamoral de Ligne (1837–1914), son of Eugène, 8th Prince of Ligne, with whom she had her only child, Maurice Bernhardt (1864–1928). Maurice did not become an actor but worked for most of his life as a manager and agent for various theaters and performers, frequently managing his mother’s career in her later years, but rarely with great success. Maurice and his family were usually financially dependent, in full or in part, on his mother until her death. Maurice married a Polish princess, Maria Jablonowska (see Jablonowski), with whom he had two daughters, Simone (who married Edgar Gross, son of a wealthy Philadelphia soap manufacturer) and Lysiana (who married the playwright Louis Verneuil ). Bernhardt also expressed strong interest in inventor Nikola Tesla, only to be dismissed as a distraction to his work. She later married Greek-born actor Aristides Damala (known in France by the stage name Jacques Damala) in London in 1882, but the marriage, which legally endured until Damala’s death in 1889 at age 34, quickly collapsed, largely due to Damala’s dependence on morphine. During the later years of this marriage, Bernhardt was said to have been involved in an affair with the future King King Edward VII while he was still the Prince of Wales. Bernhardt once stated, “Me pray? Never! I’m an atheist.” However, she had been baptised a Roman Catholic, and accepted the last rites shortly before her death. Bernhardt was one of the pioneer silent movie actresses, debuting as Hamlet in the two-minute long film Le Duel d’Hamlet in 1900. (Technically, this was not a silent film, and in fact, it is cited as one of the first examples of a sound and moving image syncing system created with the new phono-cinema-theatre system.) She went on to star in eight motion pictures and two biographical films in all. The latter included Sarah Bernhardt à Belle-Isle (1912), a film about her daily life at home. In 1905, while performing in Victorien Sardou‘s La Tosca in Teatro Lírico do Rio de Janeiro, Bernhardt injured her right knee when jumping off the parapet in the final scene. The leg never healed properly. By 1915, gangrene had set in and her entire right leg was amputated; she was required to use a wheelchair for several months. Bernhardt reportedly refused a $10,000 offer by a showman to display her amputated leg as a medical curiosity. (While P.T. Barnum is usually cited as the one to have made the offer, he had been dead since 1891.) She continued her career often without using a wooden prosthetic limb; she had tried to use one but didn’t like it. She carried out a successful tour of America in 1915, and on returning to France she played in her own productions almost continuously until her death. Her later successes included Daniel (1920), La Gloire (1921), and Régine Armand (1922). According to Arthur Croxton, the manager of London’s Coliseum, the amputation was not apparent during her performances, which were done with the use of an artificial limb. Her physical condition may have limited her mobility on the stage, but the charm of her voice, which had altered little with age, ensured her triumphs. Sarah Bernhardt died from uremia following kidney failure in 1923. Newspaper reports stated she died “peacefully, without suffering, in the arms of her son.”  She is believed to have been 78 years old. She has a star on the Hollywood Walk of Fame at 1751 Vine Street. 1862: Racine’s Iphigénie in the title role, her debut. 1900: Le Duel d’Hamlet (Hamlet, as Hamlet) An excerpt from the play, featuring Bernhardt in a duel to the death with Laertes. 1908: La Tosca (Tosca, as Tosca) A one-reel condensation of the play by the same name by Victorien Sardou. 1911: La Dame aux Camélias (Lady of the Camelias – Camille, in the U.S. release, as Camille) A two-reel condensation of the play by the same name, and co-starring Lou Tellegen. 1912: Adrienne Lecouvreur (An Actress’s Romance; as Adrienne Lecouvreur) A two-reel condensation of the play by the same name. Co-starring Lou Tellegen. 1912: Les Amours d’Elisabeth, Reine d’Angleterre (Queen Elizabeth; a major success) A four-reel condensation of the play of the same name. Co-starring Lou Tellegen. 1912: Sarah Bernhardt à Belle-Isle (Sarah Bernhardt at Home, as herself) This documentary features Sarah at home with her family and friends, fishing for shrimp, and cuddling indoors with her pet dogs. 1915: Mères Françaises (Mothers of France), as Madame Jeanne D’Urbex, a war widow in World War I. When she learns that her son has also been wounded, she searches the battlefields, crawls through trenches, and finally reaches him at a medical station only to have him die in her arms. After this tragedy, she dedicates her life to helping others survive the ravages of war. 1915: Ceux de Chez Nous (Those at Home: biographical, home movies) Among other celebrated persons of the era, there is a brief scene featuring Sarah sitting on a park bench and reading from a book. 1916: Jeanne Doré (as Jeanne Doré). Based on a play of the same name. Sarah appears as a widowed mother, who lavishes attention on her son, Jacques. When he is seduced by a temptress and accidentally murders a man, she visits him in his cell on the night before his execution, pretending to be his fiancée. 1921: Daniel (5-minute death scene from the play of the same name.) Sarah appears as a morphine addict in the hour before death. 1923: La Voyante (The Fortune Teller,) Sarah appears as a clairvoyant, who makes predictions that influence the outcome of national events. This film was Sarah’s final performance, and was made while she was mortally ill. It was eventually completed with scenes made with a stand-in performing Bernhardt’s character with her back turned to the camera. Chromolithographic portrait of Sarah Bernhardt in Vanity Fair magazine, 1879. McCormick, John (1995). “Bernhardt, Sarah” in The Cambridge Guide to the Theatre, edited by Martin Banham. Cambridge: Cambridge University Press. ISBN 9780521434379. ^ She was baptised in 1857, when she was about 12, but the record is missing. A birth date taken from a certificate of a baptism conducted at the age of 12 would not be reliable as a primary source, and could only be used to corroborate other evidence. (In The Art of High Drama, a Professor Ockman describes finding an “unidentified newspaper clipping” in the Bibliothèque de la Comédie Française in Paris, which included a copy of a baptismal certificate saying Bernhardt was born on 25 September 1844.) It has been claimed that “Bernhardt sometimes celebrated her birthday on 23 October”, although there is no verification of this claim. Bernhardt’s 1907 autobiography Ma double vie (My Double Life) made no reference to her date of birth. ^ a b Gottlieb, Robert. “The Drama of Sarah Bernhardt”. Retrieved 2007-10-18. ^ In 1859 she enrolled with that name and a birthdate of 23 October 1844 at the Conservatoire National; this is the only record surviving from before her birth record was lost in 1871. See “Snel, Harmen. The ancestry of Sarah Bernhardt; a myth unravelled, Amsterdam, Joods Historisch Museum, 2007, ISBN 978-90-802029-3-1, pp 9–10″. Snel argues that since her birth record was still available and there was little reason to obscure the truth, “this registration can be regarded as founded on facts”. ^ Aston, Elaine (1989). 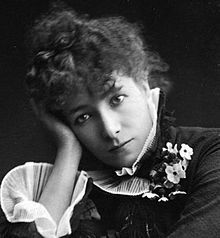 Sarah Bernhardt: A French Actress on the English Stage. Oxford: Berg Publisher’s Limited. p. 5. ^ Robert, Gottlieb (2010). Sarah: The Life of Sarah Bernhardt. London: Yale University Press. p. 121. ^ Gundle, Stephen (2008). Glamour: A History. Oxford University Press. p. 100. ISBN 978-0199210985. ^ Robert, Gottlieb (2010). Sarah: The Life of Sarah Bernhardt. Yale University Press. p. 142. ^ Almanach des Spectacles, année 1899, p. 63; Octave Feuillet’s Dalila OCLC 691937024 ; Gaston de Wailly’s Patron Bénic OCLC 48750066 and 458828120; Morand and Schwob’s Hamlet OCLC 691937174. ^ Golden, Eve. “From Stage to Screen: The Film Career of Sarah Bernhardt”. Retrieved 2007-10-18. ^ Based on the article Théâtre de la Ville in the French Wikipédia (version 12 juin 2012 à 11:13). ^ Bernhardt As Hostess; A Private View of Paintings and Sculpture. New York Times. Published Nov. 14, 1880. ^ “Edward VII biography”. Archived from the original on 2006-05-25. Retrieved 2007-10-18. ^ “Positive Atheism’s Big List of Quotations: Sarah Bernhardt”. Retrieved 2007-10-18. ^ “Filming Shakespeare With And Without Words In Settings Familiar And Unfamiliar”. Archived from the original on 2007-10-30. Retrieved 2007-10-18. ^ “The Fortnightly Review”. Retrieved 2011-04-15. ^ “New International Encyclopedia”. Retrieved 2007-10-18. ^ “Obituary: Mme. Sarah Bernhardt.” North-China Herald, March 31, 1923, p. 866. ^ Ullman, Dana (2007). The Homeopathic Revolution: Why Famous People and Cultural Heroes Choose Homeopathy. North Atlantic Books. p. 138. ISBN 978-1556436710. This article uses material from the Wikipedia article Sarah Bernhardt, which is released under the Creative Commons Attribution-Share-Alike License 3.0.